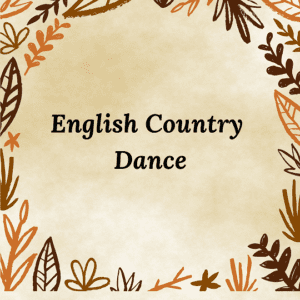 Come to the English Country Dance and enjoy moving in smooth figures to gorgeous live music. Everyone who wants to dance is guaranteed a partner. Each dance is taught, and all ages are encouraged to participate. The dance form dates back to the 16th century. It appears in some movies portraying Queen Elizabeth I, as well as in film adaptations of Dickens and Jane Austen novels. Each dance has its own music. The tunes are hauntingly beautiful, ranging from old ballads, jigs, and reels to several immortalized in classical music and opera.